As the Proud Sponsor of the Shrewsbury Club Schools Program, here at Budgen, we are doing our bit for the communities Children. We help support for the Shrewsbury Club Tennis team to visit local schools and promote the game. Twice a year when the Aegon Pro Series is hosted at the Shrewsbury Club we have a fun packed morning for local schools to bring along children who we introduce to the sport! It's a great sports club, why don't you consider becoming a member? If you're thinking of joining do mention us. Unique Copiers has been a staunch solid partner and supporter of Budgen Motors and our tireless efforts towards enriching our community and the commonwealth of our neighborhoods. Unique Copiers provides the optimum combination of copier sales, service, and supplies. Operating out of the same location for over 30 years, we have established ourselves as a key community leader and The Premier one-stop-shop location for all copier needs. Visit us at www.uniquecopiers.co.uk or come by the store and prepare for an experience that can never be duplicated. he Shropshire Star provides unrivalled news and sport coverage for Shropshire and Mid Wales, printing three editions per day, five days a week, plus one Saturday edition. The newspaper launched on October 5, 1964, inheriting a daily circulation of around 19,000 from the old Shropshire edition of the Express & Star. It became the first evening newspaper in Europe to be printed by web-fed offset, which refers to the use of rolls (or webs) of paper supplied to the printing press. And the Shropshire Star continues to lead the field in newspaper technology to this day. August 2012 saw the relaunch of ShropshireStar.com in a responsive design – believed to be a first for any regional newspaper website in the UK. Meanwhile, Shropshire Star apps for iPad and iPhone means readers can keep up with their favourite local newspaper, wherever they are. The Shropshire Star headquarters are in Ketley, Telford, where the newspaper is also printed. We want to help you in every way possible and we offer comprehensive advice on courses, excellent teaching and learning and access to the finest resources and facilities. Many of our students want to improve their qualifications or skills in order to get a new job or to improve their promotional prospects. Some of our students aspire to improving their level of qualifications. Whatever it is that is making you think about starting a course with us, it is essential that you are given as much information as possible in order to help you make the right decision. If you do not find all of the information you need on our website, then please do not hesitate to get in touch with us to find out more. Please have a good look at our website www.tcat.ac.uk or contact our Learner Services’ staff on 01952 642237 for further details. As part of our partnership with Telford College we would like to assist with all your motoring requirements, from purchase to maintenance, from MOT's to new car finance, help and advice. We have an excellent range of brand new car's and purchase schemes for Young Drivers such as Peugeot's Just Add Fuel and Citroen's Simply Drive. In fact we have a great range of cars and a great of offers. Family values and great customer services runs right to the core of the Budgen Group. 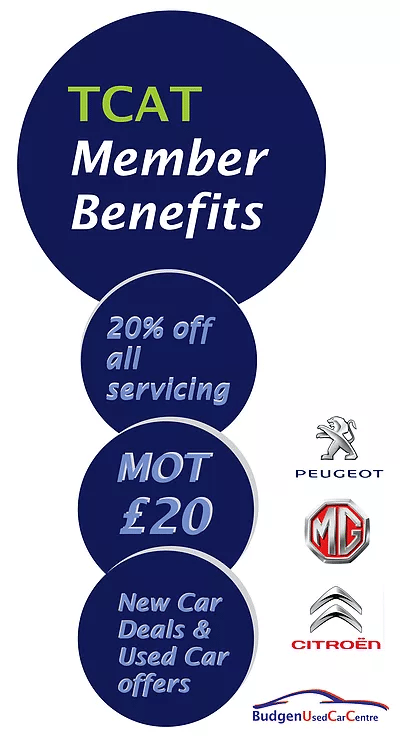 As a Student, family member or employee you are entitled to extra discount and support from the Budgen Motor Group. On all New Cars you are entitled to an additional 4.5% discount. Drop in for a coffee at any of our Budgen Sites and we will have a valetor run a sponge over your car to keep it clean. One of the first things you'll notice on arriving at the hotel is the space. With 170 acres, there is ample space for team building activities, drinks receptions and of course a round or two of golf! And this sense of space continues into the hotel. The 114 bedrooms are large, warm and welcoming. The restaurant offers a light and contemporary atmosphere with panoramic views towards the Ironbridge Gorge and with 8 conference and meeting rooms there is plenty of space for any meeting and event up to 350 people. At the end of a busy day you can take advantage of some "me" time in our sumptuous spa. With a eucalyptus steam room, ice fountain, and heated loungers, we know how to make you feel more than a little content. Then again, if your idea of magic is a peaceful night of sleep, you could just snuggle up in your super comfortable bed and drift off to sleep. If you are a night-owl, you'll be pleased to hear, we have opened our gym 24 hours a day - the only 24 hour gym in Telford.